In today’s fast paced environment and with ever evolving technologies and products, some may fear that traditions risk being cast aside in favor of the new and up-and coming. Fortunately, this is not the case in the world of tea — with more independent tea shops and vendors creating new and inventive ways to market tea, and a growing amount of options to buy loose tea leafs and tea equipment. What is and was an ancient tea tradition is fast becoming popular today. So where did tea originate from? While there are many legendary tales, historical accounts point to tea being first discovered in China, in 2737 BC, when the Chinese emperor Shen Nung whilst holding boiled drinking water noticed some leaves from the tree next to him falling into his cup and creating a change in color. He then sipped from it, smiled, and thus tea was created. The use and art of tea have been depicted in many paintings throughout history as well, circling across the globe from China, to Japan and Europe. It was indeed the Japanese monks, who after witnessing the tea practices from China brought tea seeds into Japan and soon created intricate tea ceremonies (the matcha ceremony being just one example). So what do you need to know when just starting down the Tea path? The good news is you don’t need a lot to start. A minimal cost upfront far outweighs the joy you’ll experience when brewing your own loose leaf teas. And, in today’s fast paced society we can all benefit from taking a moment to get back to basics and carving out some time for ourselves as well as connection with loved ones through good tea. Most importantly, instead of reaching for that general tea bag brand – the satisfaction of cutting out the middle man (or is that the tea bag?) and concentrating directly on the actual tea leafs, the tea is (literally) out of the bag and has many health benefits as well as being a budget friendly hobby and something to enjoy and share with others. When it comes to purchasing tea we suggest purchasing fair trade, and organic and environmentally friendly teas (if/when possible). Not only is certified organic tea free of synthetic fertilizers, herbicides, and pesticides, organic tea agriculture sustains the health of soils, ecosystems and people. This is better for the environment and supports local farmers. With that in mind, there are numerous very high quality teas available, beyond organic varieties. The key is finding reputable growers and brands, and to know the source of your tea. There are many tea options to choose from and with so many flavors available your taste buds can experience the broad range – yet finding the right one for you is a case of trial and error – but that’s part of the fun of it! You may discover that you prefer green tea, or be surprised about the many differences in taste across oolongs sourced from different mountains or regions. Or, like many readers of TeaMinded, you may become addicted to matcha (this is a good thing, by the way). To get started, here are a few teas to choose from; Green, White, Oolong, Black, Pu-erh, Herbal, Matcha, Chai, Artisan, Blends. We all know the benefits of water and the impacts on our bodies and health. And, when it comes to tea making the use of fresh and purified water is very important. Before preparing tea, we suggest using spring water or natural bottled water, since the natural minerals from this type of water enhances the tea’s flavor. The use of water from your kitchen tap is not encouraged, however it’s not harmful if properly boiled — it’s all about getting the balance right. The process of boiling water to a gentle boil helps eliminates any harmful germs or bacteria (and at this point, the water is sufficiently heated and the oxygen count is high). A vital step in the process of tea making is a tea infuser or strainer – it is one of the ultimate deciding factors in how your tea will taste. A tea infuser’s job is to keep tea leaves from floating in your cup whilst pouring and draining your tea. A brew basket, on the other hand, provides a clean and easy way to place the tea leaves directly into your cup or teapot and permits effective steeping whilst leaving ample room for the tea leaves to expand. Both products will last you many years if you care for them well. There are a wide variety of boiling techniques and products to use when making tea, but a budget friendly kettle or teapot will more than suffice. When boiling water for your tea, temperature is important. Different varieties of tea require different temperatures. Most good loose leaf tea brands will provide guidelines on temperature and steeping times. As a general rule of thumb, green and white tea leafs often are brewed at lower temperatures, while black and fermented pu-erh teas taste better with longer infusions and higher temperatures. The more you practice the more you will become accustomed to your tea preferences and your tastes. And here comes the best part…once your tea is perfected and made to your taste; it’s time to pour it into your favorite mug, cup or glass. Your vessel of choice will often depend on the type of tea, combined with the volume of tea, temperature and your personal preferences. Materials like glass or porcelain are more likely to release the heat quicken, so if you want to retain the heat a little more we suggest using a thermal flask or recycled stainless steel mug. 1. Prepare fresh water and pour into a kettle. 2. When the water is at a gentle boil, remove from the heat. 3. Pour the hot water into a teapot or teacups. 4. Add the correct amount of tea leaves per person to the empty pot. 5. Allow water to cool to temperature and pour into the pot over the tea leaves. 6. Steep for the proper length of time. 7. Strain the leaves completely into another teapot or directly into serving cups. If you regularly take part in the practice and tradition of loose tea leaf making, then you will be accustomed to certain historical ceremonies that make the process of tea a social and reflective experience. Today we want to delve a little deeper into two deeply seeded traditional tea ceremonies and how you can incorporate these practices into your routine in this modern world. An effective Gongfu tea ceremony involves a 21 step brewing method known as Chaozhou Gongfu Cha, and originally originated from Chaozhou during the Song Dynasty. Gongfu is a traditional way of preparing tea by infusing tea into a small teapot, with multiple steepings. Some people can get confused about Gongfu, thinking it is a type of tea, when in fact it is the art of and physical act of brewing tea. Gaiwans often play a leading role in Gongfu tea ceremonies. These steeping vessels consist of a 3 parts (cup, lid and coaster) and are mostly made from porcelain (but you will also see glass varieties in the marketplace). Though they’re mainly used to steep tea, many people also use Gaiwans as tea cups to drink from. Porcelain Gaiwans also don’t affect the flavor of tea, which can be an advantage. Gaiwan (steeping) or glass / transparent glasses are also a great way to appreciate the appearance of unfurling tea leaves. In Japanese culture, matcha green tea is much more than a drink. The matcha tea ceremony has been an integral part of the traditional Japanese culture for centuries. A quiet celebration performed with grace and beauty, the matcha tea ritual is a bonding experience of mindfulness, respect and a focus on the here and now. 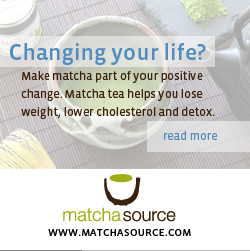 Matcha tea is primarily a grade of tea that contains 15 times more nutrients and health benefits than any other green tea, and these benefits coupled with the ceremony provides a total body and mind peace. To perform the ritual involves dedication, and a series of graceful hand movements and plenty of confidence; however you don’t need to be a spiritual figure to take part in your own ceremony unless you want to practice the direct art of it (if so please keep us updated with your progress!). Traditionally, students and the master gather in a room set by the host and begins the matcha that involves a series of cleansing rituals, silence and grace. So how can you incorporate these rather complicated and time consuming tea making ceremonies into your routine? Incorporating a natural tea routine actually makes it easier to take care of ourselves and our life as a whole – and best of all, it’s all natural. Dedicate a certain day or night of the week where you gather friends and family to take part in your own makeshift tea ceremonies and don the traditional practices. Touch base with your neighbors and community and plant tea seeds together, not only does this help the community and environment but it also forms bonds with your community. Support local businesses, vendors and farmers by purchasing tea directly, instead of from big corporations and chain supermarkets. Want to help the world? Then start with the space around you. Our planet needs more love than it ever has. With global warming concerns ever-growing and our need to recycle, a natural tea routine can actually help the world and eliminates tea bag waste, which in turn helps protect the environment and animals. Dating back to the origins of tea ceremonies it has been documented that the practice has meditative and healing benefits. There are many opportunities to mediate yet why don’t we do it? The common answer is that we ‘don’t have time’ yet mediation doesn’t have to take much time at all, in fact it can be done relatively anywhere. There are many apps that you can download for quick bursts of 5-10 minute mediations but we suggest taking the time to make tea and then enjoy that cup of tea in nature. Being in a calm environment will significantly improve your wellbeing, as well as looking after the environment. Brewing loose leaf tea is often a conversation starter as well as a nourishing hobby. Tea is meant to be enjoyed regardless of what method you use – much like a fine wine it gets better over time, and so will you at practicing and making it. Just remember to be patient with yourself as you create your new tea making routine, it can take some re-adjusting to this new way of life, from figuring out which tea leafs to use to recycling, but always keep in the back of your mind why you want to create this routine and remember the wonderful exploration of new tastes – this will forever keep you motivated. We hope these steps have helped, and that you now feel confident to make your own tea. Remember to keep us updated on your progress via our social media (Twitter / Facebook / Instagram) and let us know in the comments what your favorite teas are. As all tea lovers are aware, the secret to having that perfect cup of tea is to know the right method of tea brewing, and that requires the right equipment. A very important part is played by such things as: water temperature, steeping time, the equipment, quality of the loose tea leaves and the quality of the water.